Utah Olympic Oval, The Fastest Ice On Earth! It's and we would like to welcome you to the Salt Lake Tourist & Visitor Centers official online edition. This page provides detailed information on The Utah Olympic Oval. The Oval stands uncontested as the "Fastest Ice on Earth" following the 2002 Olympic Winter Games. The Utah Olympic Oval was built with the purpose of hosting speed skating competitions during the 2002 Salt Lake Olympic Winter Games, but serves as a legacy to the State of Utah for all members of the community to enjoy. The Oval, as well as the Utah Olympic Park in Park City, is operated by the Utah Athletic Foundation. The Oval is part of a multi-purpose recreation complex that includes recreational gyms, weight facilities and swimming pools. With an incredible 10 Olympic records and eight world records, the Utah Olympic Oval stands uncontested as the "Fastest Ice on Earth" following the 2002 Olympic Winter Games. As impressive as the record breaking performances were, it was the performance of the U.S. Olympic Speedskating Team during the Games that has generated a worldwide "buzz" surrounding the Utah Olympic Oval. The team relocated to Salt Lake City in January of 2001 to begin training in the Olympic venue 12 months before the rest of the world was expected to arrive. At the end of the 2002 Games, the U.S. Speedskating team had garnished an astonishing eight Olympic medals won by six individual team members. The depth and success of the U.S. team caused the rest of the world to take notice and attention quickly turned to the concept of home field advantage. The athletes were generous with their praise, identifying the training environment at the Utah Olympic Oval as a huge factor in helping them realize their full potential as Olympic athletes. The U.S. Speedskating team continues to use the UOO as its home training base for the men's and ladies' long track team because of the services the Oval provides and the friendly, experienced staff who works there. The Utah Olympic Oval successfully hosted its first major international speed skating competition three weeks after the completion of the oval construction in February 2001. 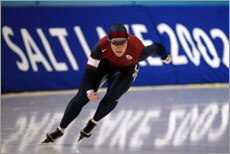 The success of the 2001 World Championships Speed Skating Single Distances event was overwhelming, bringing more than130 athletes from 20 countries to Salt Lake City for this prestigious competition. As a preview to the Olympics in 2002, an incredible five world records were broken in the Utah Olympic Oval's debut competition. The format of the Single Distances Championships is very similar to that of the Olympic Games making this event a great test and learning tool for the staff, volunteers and facility. 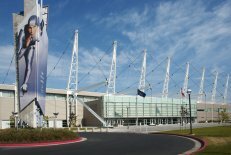 Salt Lake's Hottest Visitor Attraction The Utah Olympic Oval is an ideal location for both summer and winter events and activities. Visitors and guests enjoy a breathtaking view of the Wasatch Mountains as they join in the fun. All levels of learn to skate classes are available with advanced instruction in figure skating and speed skating for the future Olympian in all of us. Indoor soccer is a great way to beat the summer heat and winter cold with a variety of high school, co-ed, youth and adult leagues. We also offer a great social experience and quality hockey experience with our adult leagues. Drop by for open hockey and sledge hockey sessions. It's fun for all ages! Public Skating The Utah Olympic Oval offers public skating sessions year round. We invite the public to enjoy a fun and affordable experience on the ice made famous at the 2002 Olympic Winter Games. Special activities are offered every month such as "Cheap Skate", Schools on ice and the Scout merit badge program. Celebrate your next birthday with one of our unique birthday packages. 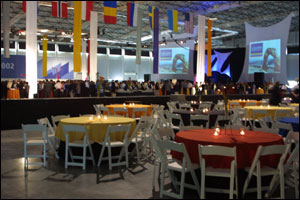 Located only 25 minutes from downtown Salt Lake City, the Utah Olympic Oval is an ideal venue for a wide variety of functions including meetings, receptions, corporate retreats, banquets and family reunions all year round. The Utah Athletic Foundation - operating under the tradename Utah Olympic Legacy - is a Utah non-profit organization responsible for managing and maintaining our world-class Olympic legacy facilities and providing opportunities for people of all ages and abilities to participate, educate, and excel in winter sports.